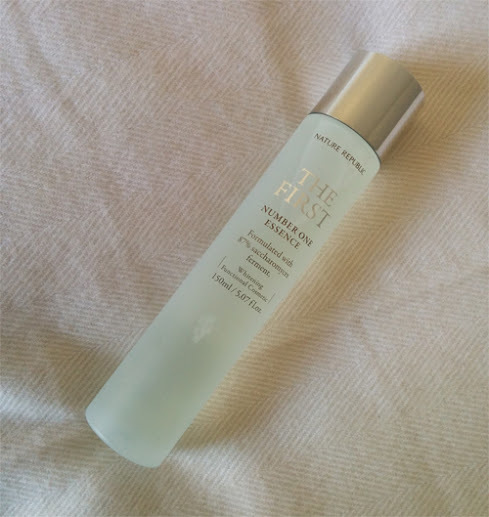 I wrote about the benefits of using fermented essences and I had mentioned in the post that I recently bought The Fist Number One Essence from Nature Republic. First made famous by SKII, products that contain ingredients derived from the fermentation process are supposed to make your skin more radiant, glowing, brighter, and smoother in appearance. So did the essence live up to its claim? Click through the jump to read my review! UPDATE: Nature Republic has released a new reformulated version of this essence which I wrote about here! Saccharomyces (yeast) extract, propanediol, niacinamide, 1,2-hexanediol, betaine, burdock extract, centella asiatica extract (Indian pennywort), portulaca oleracea extract, phellinus linteus extract (black hoof mushroom), arctium lappa root extract (burdok), rosemary extract, chamomilla recutita flower extract (chamomile), piper methysticum extract (pepper plant), pueraria thunbergiana root extract (kudzu flower), licorice root extract, paeonia lactiflora root extract (white peony), cnidium officinale root extract (marsh parsley), phellodendron amurense bark extract (Amur cork tree), lavender extract, althaea officinalis root extract (marshmallow), basil flower/leaf extract, linseed extract, aloe barbadensis leaf extract, hibiscus esculentus fruit extract, houttuynia cordata extract, anthemis nobilis flower extract (chamomile flower), fennel fruit extract, orange fruit water, PEG-40 hydrogenated castor oil, soluable collagen, aloe barbadensis leaf juice, sodium hyaluronate (sodium salt of hyaluronic acid), grapefruit peel oil, olive fruit oil, lime oil, hydrogenated lecithin, black currant seed oil, rose flower oil, anise fruit oil, water, xanthan gum, phenoxyethanol. For the first steps of skin care, dispense liberally on a cotton pad and apply it to the entire face. When using it with [a] clear toner, apply it after using [the] toner. The product is housed in a heavy frosted glass bottle that looks lovely if displayed on a vanity. It has a plastic top dispenser similar to what toners usually have. I've been using the First Essence for about a month now, twice a day (morning and night) along with the toner & emulsion. I don't use a cotton pad, but instead I pour the product directly into my hand and pat it into my skin. The essence just feels like I'm putting water onto my skin. I use the toner first, then the essence, and then the emulsion (quick tip! Always put on your skincare products from the thinnest to thickest textured). The product does have a smell, but it's nothing pungent, strong, or adverse. It smells similar to the Laneige Water Sleeping Pack - spa like, clean, and light. The products have noticeably and significantly brightened my skin. The brightening effect was noticeable in about 4-5 days, and most definitely within the first week of using it. It is not a type of glow that you get from using your illuminizer that sits on the surface of your skin, but instead your skin's clarity and color is brighter from the inside-out. Needless to say, I'm extremely happy with the results!! I will probably buy the emulsion as well because I really like the texture of the product and I feel like it does a good job of sealing in the toner and essence. The essence in my hand - completely clear and like water. You want brighter looking skin. You want smoother more even toned skin. Honestly, I think everyone would benefit from this product. Doesn't everyone want brighter, smoother, more even toned skin?? This is my first fermentation essence, and it has given me extraordinary results. Many times you've read about a product that does "x" but then you try it and it doesn't. This essence has actually really smoothed out and brightened my skin significantly like it said it would. Just like working out, you see the most significant and fastest results within the first week or two of using it. Afterwards your skin basically just looks brighter naturally and maintains that clarity. I'm afraid to stop using it to see whether my skin will revert because I just love the way my skin looks now! You can purchase Nature Republic's The First Essence from Amazon and Yesstyle. If you're lucky enough to live in the New York area, there are two Nature Republic storefronts, one in Chinatown and one in Flushing, Queens. If you want to see other options for similar fermented essences, check out my post! Sounds great. I want to try it too. Does it contain anti aging formula? What is the difference with non-fermented ingredients product? I mean, the skin care product is better for skin when it contains ingredients from the fermentation process? Hello! You should definitely give it a try! As for your questions, fermented essences themselves are anti-aging products because they are formulated to smooth out your skin and therefore target fine lines. However, the essences really brighten your skin which I think also adds to the product's anti-aging claims. Fermented ingredients are better for you skin because it allows our skin to better absorb the beneficial ingredients. Basically, the molecular structure of fermented ingredients can travel better through the outer barrier of our skin and into places where we need it most. Hope this helped! Hi! I have acne-prone skin too, and it's not harsh at all on my skin! If anything, I think it's helped fade my acne scars and made my skin look brighter despite the occasional breakout. I definitely think this essence would be appropriate for you. It just feels like you're putting water onto your skin. Definitely try it out and see! I'm so into it after reading Ure review:D Thanks!